Place all the ingredients into the bread machine pan according to the order in the manufacturer's instructions. Set crust on medium and program for the Basic or Whole Wheat cycle; press START. When the baking cycle ends, immediately remove the bread from pan and place it on a rack. Let cool to room temperature before slicing. 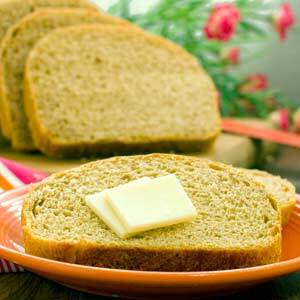 Combine whole wheat flour, 1 cup bread flour, salt, nutmeg and undissolved yeast in a large mixer bowl. Combine sweet potatoes, liquid or water, honey and butter; heat to very warm, between 120° to 130°F. Add to flour mixture and beat 2 minutes. Add egg. Beat 2 minutes more. Add more flour or liquid as needed to form a dough that starts to pull away from the sides of your bowl. Turn dough out on lightly floured surface and knead 8 to 10 minutes, until smooth and elastic. Cover and let rest until double in size.